As part of the MegaDo were were (semi) surprised to learn that we would be flying on United's Brand New 787 Dreamliner! Surprise! Now I love to travel but I am not a big aviation (plane) geek but I must tell you I am becoming a one. 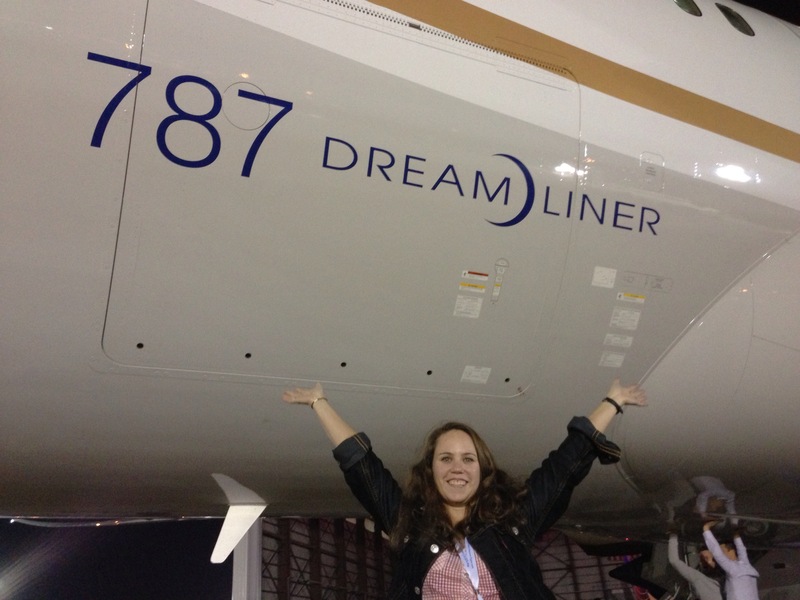 And Yes the Dreamliner was all that it was made out to be. Read more to find out what I Loved It and my Not so Much Lists. Including pictures! How Quiet it was to fly! This is due to increased interior enhancements such as the advance vibration isolation, quiet air conditioning, new noise reducing design from the engines inlets and fans and noise reducing chevrons on the engine. Oh and the food!- Yes I said it the food was great! United really out did itself by providing first class food for the entire flight. Normal I never eat airline food but it was to good to pass up. And I must give a shot out to the Flight Attendants that worked incredibly hard to serve the entire flight. Wowza! The entertainment system- We have really been spoiled! But there is nothing worse than realizing there is only one movie to watch for the 10 hour flight and you have already seen it. The system comes loaded with new movies for adults and kids plus some classic favorite such as Goonies! Plus there is in flight Trivia that you can play against other seat members. There is also a navigation screen to watch distance to destination and other games. All in all we were impress that United finally has upgraded the system! The smoother ride. Now this doesn't mean there is not turbulence but the Dreamliner does have new early warning technology to pinpoint upcoming turbulence and compensates for it. For someone that really doesn't like turbulence this is wonderful news! The wings really do bend up! The Dreamliner is composed of 50% composite materials which helps with the fuel economy. The break down of the exterior is 50% composite materials, 20% Aluminum, 15% Titanium, 10% Steel and 5% other. The winds tips bend so far up that they seem to rise above the top of the plane. The Spacious Storage- On the Dreamliner you now can stow you rollerboard on its side which allows for more bags. This doesn't mean it won't get full (with the new airline baggage fees) It just means more people can get there bags on. The LED Lighting- Helps set the party mood. There are settings for boarding, meals, relaxing, cruise, sleep and preloading. See the image for MegaDo Party Setting! The lower cabin altitude. Typically cabin altitude is set at 8,000 ft standard on normal aircraft but on the Dreamliner it feels like 6,000ft! You arrive feeling rested and ready to go with the increased oxygen absorption into your body! The automatic closing toilets!- I really hate using public toilets so anything that allows me to touch toilets less I like. Just wave your hand in front of the blue button and the lid automatically closes and flush. Brilliant! Air filtration system- The 787 uses HEPA filters to remove bacteria and filters to remove odors and contaminates which makes me happy when I arrive home without a cold! I really didn't like the 3-3-3 seat configuration. What can I say I am a window girl but hate feeling trapped. Travelmista is an aisle guy so there is no comprise for us on this plane. I gave in to his aisle request but got stuck in the middle of the plane with no hope of being near the window. But I did manage to get his aisle later on! While the windows do get semi opaque they don't completely block the light which could be hard to sleep during the daytime. This could be a problem especially when traveling with kids. Not only is it another thing to play with but also something that could break. The one thing we didn't like about the entertainment system was the incredibly SLOW Trivia system on the plane. For the face pace need-it-now crowd it was painfully slow to load the next question. It also locked up when too many people started to play. This needs some work. It felt like I was playing Oregon Trail on my Apple 2E! Call Back to the 80's. All in all the Loved It list really does out weigh the Not so Much List. After the flights it will now be hard to go back to reality and fly the CRJ to MSN! I really wish every plane was an 787 Dreamliner. Come On Boeing ramp up production, the public will love this plane!